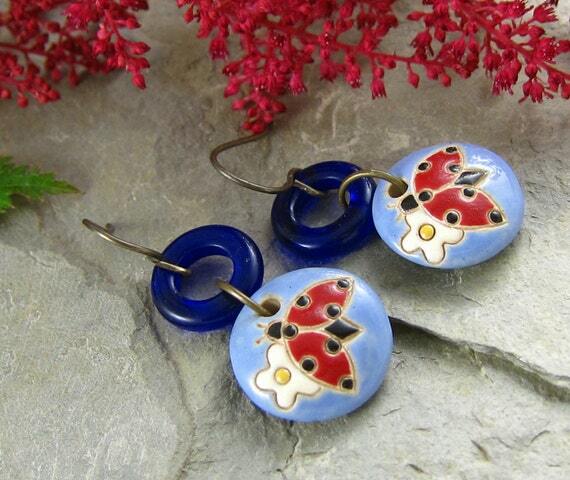 I’ve had these ceramic ladybug charms from Golem Studio for a quite a long time. They look like they’d be so easy to design with, but for some reason, everything I tried to pair with them fell flat. About a month ago, my friend Lee Anne, and I headed up to Tacoma to visit the Bead Factory, one of our favorite bead shops. I bought a bunch of glass rings there. I remember Lee Anne asking me what I planned to do with them. I shrugged and replied vaguely that they might come in handy for earrings. But in truth, I wasn’t sure what I would do with them, till last week. First I tried dangling the ladybugs from red glass rings. After staring at them awhile, I decided that I liked pairing the charms with the rings, but that the red was just too garish. I tried them with the blue rings and viola! Perfect! Sometimes you just have to let your art beads hang around for a while, till inspiration or just the right accents appear on the scene. I love these earrings for fun and whimsical spring and summer wear. 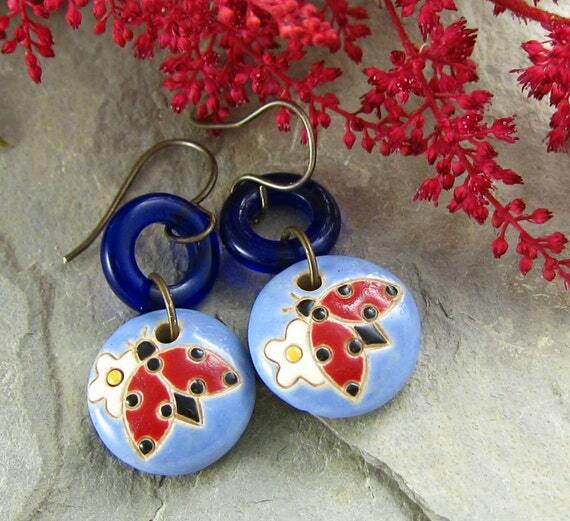 The “Ladybug Earrings” are available in my Etsy shop now. The next pair of earrings I made were completely different from the Ladybug Earrings. Rather than whimsical, the “Midnight Glow Earring”s are quite elegant. I love the handmade lampwork glass headpins made by Havana Beads. My friend, Kristi Bowman tipped me off to this shop and now I’m a big fan. I placed bluish-black shell pearls above the headpins, separated by pretty sterling silver spacers. These earrings would look great with a LBD or with jewel tones, don’t you think? The “Midnight Glow Earrings” are now available in my ArtFire shop. This entry was posted in Art Beads and Components, Bead And Jewelry Challenges and tagged Art Beads, Art Jewelry Elements, bead blog, blog hop, earrings, fashion, Golem Studios, handmade earrings, handmade jewelry, Havana Beads, Kristi Bowman Design, Linda Landig Jewelry by Linda Landig. Bookmark the permalink. That’s so true. Sometimes the bits and pieces you’ve had forever are the exact thing you never knew you needed. I love that first pair the rings go so well with the charms and they look so summery! We both used Golem and HavanaBeads this week. Great minds!! Beautiful earrings as usual LInda! Such opposites in terms of design, yet they are both beautiful. I love the glass rings on the first pair, and of course the glass headpins are stunning on the second pair. Both pairs are very different and spectacular. Well done! Those lady bugs are so darn cute! But wow! The midnight glow pair is just stunning. I’m glad you took a second picture of them b.c the grey back ground washed them out and you couldn’t really see the amazing detail on those drops.